I have to admit. This book completely blew me away. I didn't really know what to expect going in, except that it was a western. 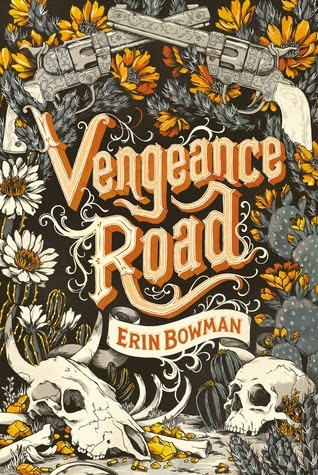 This is my first book by Erin Bowman and she definitely hit the mark for me. I loved everything about this one: the writing, the storyline, the characters, the romance... I did NOT want to put it down. I really enjoyed Kate as our protagonist. She is fierce and unapologetic, taking on a more traditional male role during this time period with her thirst for vengeance. She doesn't even think twice about it either. She vows to avenge her father, after the Rose Riders hung him and burned their home down. She has no other family and really doesn't have anything else to lose, so she saddles her horse, gets a few necessities, and heads out. Her father always said if anything ever were to happen to him that she should go see a man named Abe in a nearby town. She does so, only to find Abe has passed as well, but his family knows to expect the child. However, Kate is not going by Kate. She has cut her hair and has disguised herself as a boy named Nate. It is here that she meets up with Abe's two sons, Jesse and Will Colton, who end up accompanying her on her way. I liked Jesse a lot. Jesse and Kate are both pretty stubborn and tend to knock heads, but I liked seeing that between them. Jesse is a good guy even though he could be hot and cold with Kate, especially after he discovers she's really a girl. He makes mistakes and ends up regretting some of them. On this type of journey, there is always a significant level of danger and you have to be prepared for anything and expect the unexpected. Bowman does not hold back and we get to experience betrayal, grief, happiness, and we certainly get some surprises thrown in as we go. This book was non-stop action for me. I had a hard time finding a stopping place because one thing would keep leading to another! I was a little fearful that I wouldn't get the ending I wanted, but I thought Bowman did a great job and I thought it was quite fitting. It's refreshing to read a stand alone for once, but I honestly did NOT want this book to end and I certainly didn't want to leave the West! WOO! I'm so happy you loved this one, Jess! I adored it so much and I agree, Erin Bowman did not hold back with this book. My heart hurt with that big thing that happened. It still hurts! I'm hoping she'll get back to this world some day because there are so many possibilities to explore! I honestly didn't have much interest in this book because I didn't love the other book I read from this author, but you are making me rethink that decision. It sounds different and you clearly loved it so maybe I'll have to give it a shot. Great review! I have been seeing some very good reviews for this one! I do love the sound of it and I love the sound of the main character. How she takes on a more male role is very intriguing and it really makes me curious about her. And of course the action has me all excited to pick it up as well! This was so damn fun and different and just plain good! Loved it! I adored this one too! I read Erin's previous books but VR is her best book to date! I loved Kate and how she was such a grey character, complex and not entirely easy to like at first! And I agree, it's so refreshing to read a standalone! But now I want a companion novel or something! Great review, Jess! So glad you loved this one, too. I felt the same way - I just could not put it down. The atmosphere was so well written, I felt like I was right there with Kate. I wish there was a bit more romance, but I did love the slow burn!